Are you an avid scrapbook enthusiast? Maybe you have been looking for ways to customize each page with your own distinctive style and want to show your memories in a unique way. Our 12×12 scrapbook pages can be fully customized to reflect your personality and showcase your favorite photographic memories. Choose from a variety of templates that are perfect for any occasion and fill up your scrapbook album with your most cherished photos. Check out our 5×5 and 8×8 scrapbook pages for more scrapbook page options. Whether you are looking to show off your family photos, vacation pictures or commemorate your wedding, we offer a large variety of scrapbook pages templates that are tailored to any taste or occasion. Allow your scrapbook to reflect your life’s best moments and print out your own customized pages, each with its own theme and photos. 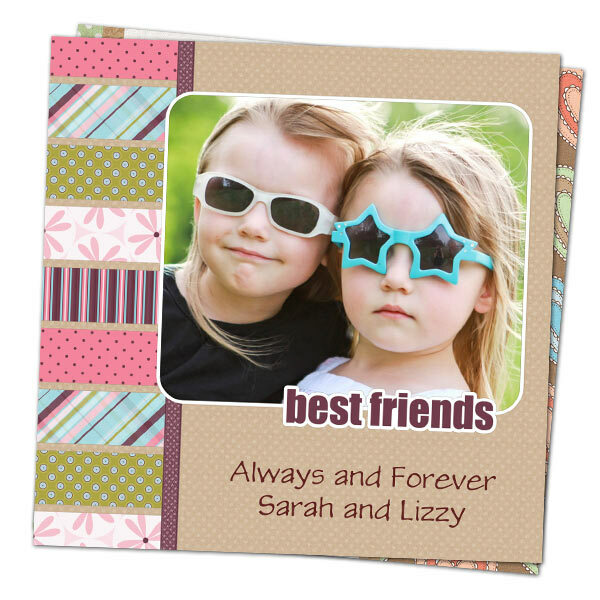 Printing 12×12 scrapbook pages has never been this fun and easy! Maybe you have some photos from your recent birthday party that you want to add your scrapbook. Find a template that fits your photos to a “T” and create a stunning addition to your scrapbook that shows off your birthday memories in style. Some of our best memories are from vacations with our family. Your best vacation moments would be perfect for display in your scrapbook album. We offer a range of backgrounds that would be perfect for your travel themed pictures. No matter how you want to update your scrapbook, we have a full range of options to choose from. Simply add your own photos to your chosen template and include your own customized text. Transform your scrapbook into the ultimate walk down memory lane with your own creativity and unique style. If you are into commemorating your fondest memories, we also offer a range of photo books perfect for any photo collection. Instead of traditional tape, scissors and glue, why not design your scrapbook pages online. Better yet, you can create your own scrapbook pages using your favorite digital photos right from your phone. Simply upload your favorite Android or iPhone photos directly from your phone’s photo library and let your creativity flow. Select your favorite template and design a series of artistic pages that show off your best memories captured from your mobile device. Printing 12×12 scrapbook pages has never been this simple. With so many options to choose from and an easy ordering process, you can commemorate your favorite photos with a quality scrapbook print for any occasion. Update your scrapbook using your own creativity and place your order with ease. Our 12×12 scrapbook pages are easy to create and are available in so many options that are perfect for your own custom scrapbook album. Simply upload your photos, design your layout and place your order and enjoy a lifetime of beloved memories year after year. Creating the perfect scrapbook pages couldn’t be simpler and you are sure to design one that is befitting of your own personal style. Bring your cherished memories to life and display them proudly with your own customized scrapbook pages today!